I was standing in the back of a packed auditorium at Ramstein Air Force Base in Germany last year, a few steps away from Gene Cernan, the commander of Apollo 17 and the last man on the moon. We were part of a morale tour of military bases in Europe and the Middle East  a tour that also included such aerospace legends as Jim Lovell, commander of Apollo 13, and Neil Armstrong, the first man on the moon. The service members in the audience were all young enough to be the sons and daughters  or grandsons and granddaughters  of the moon men present, and the tour organizers thus reckoned the troops could use a short video clip explaining the missions before the astronauts themselves appeared. As the screen filled with by-now-grainy images of the Apollo 17 moon walkers bunny-hopping across the Taurus-Littrow valley, the present-day Cernan gestured to me to step closer. "Man, that was fun," he whispered dreamily (and Cernan doesn't do dreamy). "When we were running simulations, we used to have a pause button so we could freeze things in place to consider them. I remember thinking that I wished I had one with me then." Life, alas, offers no such stop-action feature, as the now 77-year-old Cernan surely appreciates. But the moon does  at least a topographic one. On the airless, windless, weatherless expanse of the lunar surface, a scratch in the soil made in 1972 will still be fresh years, millennia and epochs later. And today, the Lunar Reconnaissance Orbiter (LRO), a NASA research craft that has been circling the moon since 2009, sent home poignant visual proof of that, beaming back the crispest images ever of the Apollo 12, 14 and 17 landing sites. LRO has barnstormed all six lunar-landing sites before, but the new images  while still black-and-white and requiring something of a space junkie's tastes to be fully appreciated  are dazzling by comparison. (All of the pictures are interactively viewable here.) Part of the reason for the crispness of the pictures is the exceptional resolution of the LRO's onboard cameras, far sharper than any set of nonhuman eyes sent up before. The rest is due to the LRO's plainly flying so low. The Apollo command modules orbited at an altitude of about 60 miles (100 km). 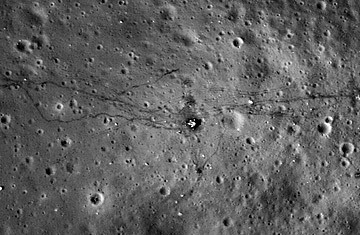 LRO's average altitude is about half that (31 miles, or 50 km), but to capture the new images, the controllers adjusted the orbit so that its lowest point  or perilune  was only 13 miles (21 km). At that comparatively treetop level, newly sharp details sprang into view  footpaths, equipment, cables and tire tracks from the lunar rovers, as well as the Apollo 17 rover itself and the leggy lower half of the lunar modules that took the astronauts down to the surface. Also faintly visible is Apollo 17's American flag. "We can retrace the astronauts' steps with greater clarity to see where they took lunar samples," says lunar geologist Noah Petro, a member of the LRO science team at NASA's Goddard Space Flight Center in Greenbelt, Md. Visible too is a little robot scout NASA sent out more than two years before astronauts ever set boot on the moon. In April 1967, Surveyor 3 landed in the moon's Ocean of Storms, precisely in the region targeted by Apollo 12 in November 1969. Commander Pete Conrad and crew member Al Bean found Surveyor, snipped off its camera and took it home to study the effects of the lunar environment on high-tech equipment. At the time, Surveyor was the relic and the Apollo lander was the living, breathing machine that had gone for a visit. Now they are both artifacts, untouched for more than 40 years and likely destined for decades of further solitude. While LRO was sent to conduct in-depth studies of the lunar surface and interior, the scientific value of the new Apollo pictures is likely limited. They weren't taken to prove the power of the new cameras; that was already established. And they certainly weren't taken to appease crackpot factions pretending the moon landings never took place; those people have long since proved themselves immune to reason. The shots were taken, mostly, as a breathtaking reminder of what humanity  and the U.S. in particular  once did, and what we could do again if we chose. If they also freeze a moment in time for Cernan and the 23 other men who ventured out that way with him, well, so much the better. Read about the Apollo 1 fire. Read about remembering Apollo 13, 40 years later.